A new parametric method for generating synthetic faces is proposed in this study which could be used for psychophysics studies on face perception . Two separate programs, one in Delphi 2005 programming environment and another in MATLAB® is developed to sample real faces and generating synthetic faces respectively. The user can choose to utilize default configurations or to customize specific configurations to generate a set of synthetic faces. Head-shape and inner-hairline is sampled in a polar coordinate frame, located at the center of a line connecting two eyes at 16 and 9 eqi-angular positions. Three separate frames are placed at the left eye center, nose tip and lips to sample them with 20, 30 and 44 angular points respectively. Eyebrows are sampled with 8 points in eye coordinate systems. Augmenting vectors representing these features and their distance from the origin generates a vector of size 95. For a synthesized face, intermediate points are generated using spline curves and the whole image is then band pass filtered . Two experiments are designed to show that the set of generated synthetic faces matches very well with their equivalent real faces. Generating synthetic faces. Left, shows an interpolated synthetic face from sampled points. At right a number of final generated faces are shown after band pass filtering (Males are shown at top and females at bottom). It is also possible to interpolate two faces to each other and generate faces in between. Performance in a discrimination task. We designed a gender discrimination task to see whether our faces carry information needed for gender categorization. In each trail, subjects were asked to determine the face gender by pressing a button indicating male or female gender. As shown in Fig. 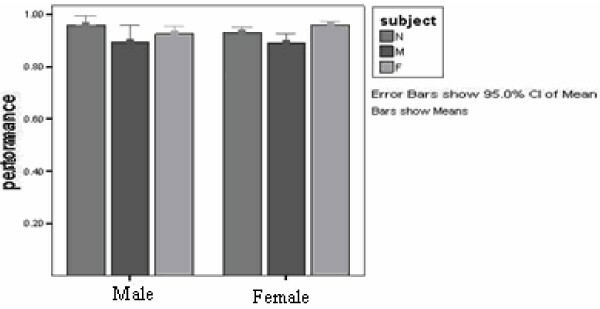 2, mean subjects performance in this task was 0.92 and differences between female and male targets was not significant. The subjects had no significant difference as well (P > 0.05). We thank H.R Wilson for his helpful comments and presenting us parts of his code.